You have just a few choices when working with PDFs and Microsoft PowerPoint compared to everything you can do with PDFs in Microsoft Word. 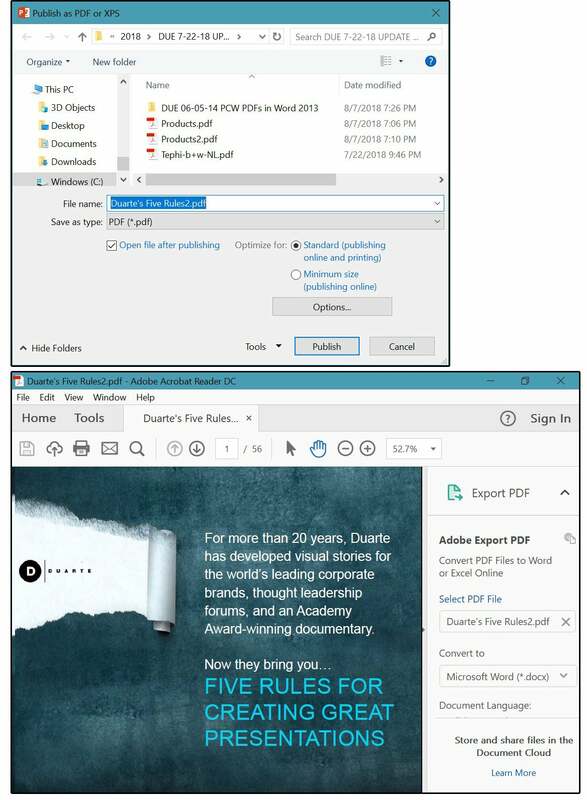 You cannot import PDFs from Adobe Acrobat directly into PowerPoint 2016. However, you can export PDFs from PowerPoint to Acrobat, and you can export from Acrobat to PowerPoint. We'll show you how. 1. 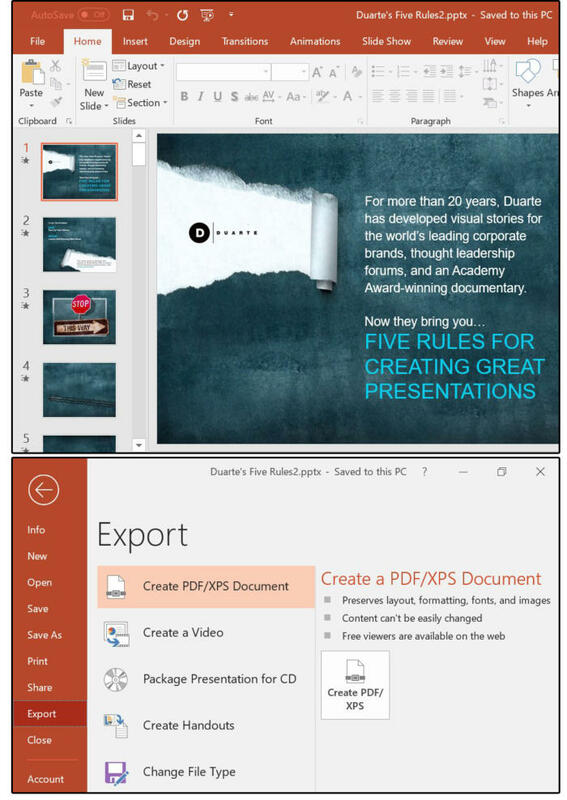 To export from PowerPoint to Acrobat, open a PowerPoint presentation. 2. Choose File > Export, and click the Create PDF/XPS button. 3. 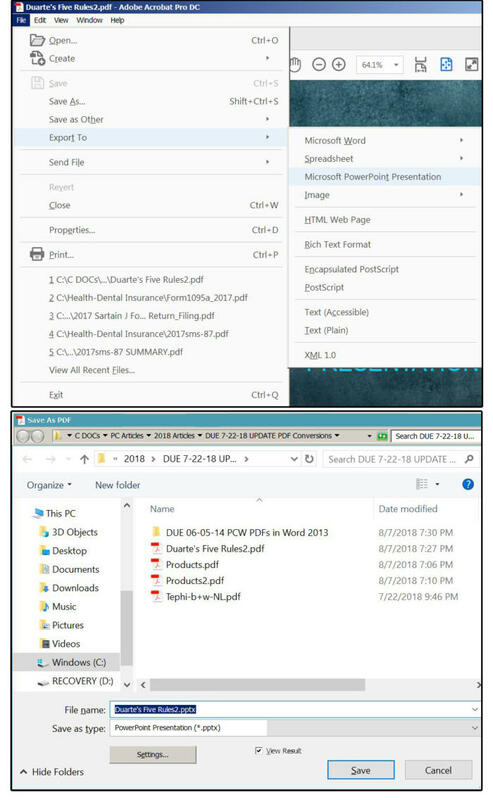 The Publish As PDF screen appears, showing the PowerPoint Presentation's filename followed by the Acrobat extension PDF in the File Name field box, followed by the PDF extension in the Save As Type field box. 4. Click the Publish button and the system jumps to Adobe Acrobat, showing your PowerPoint presentation as an Acrobat PDF file. 5. 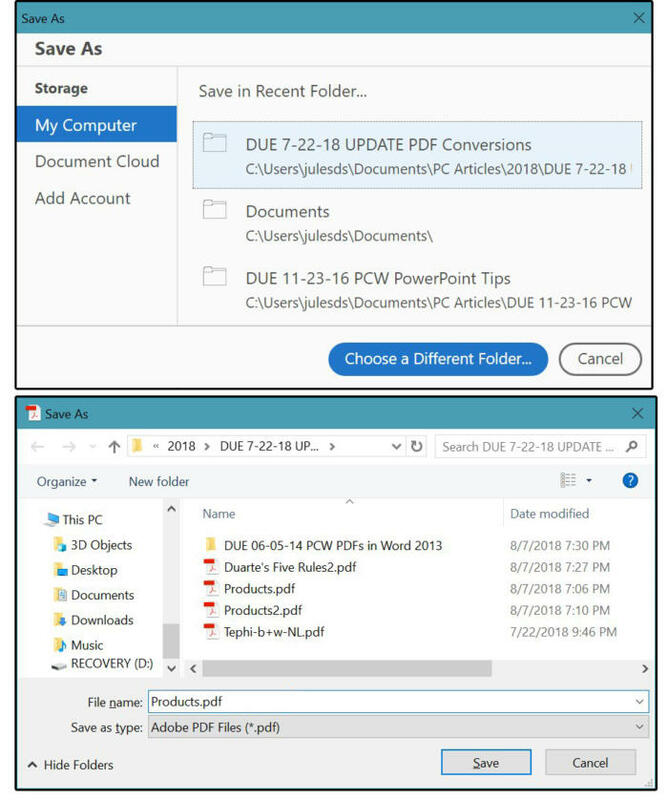 Choose File > Save As, then browse to the applicable folder (if necessary). 6. 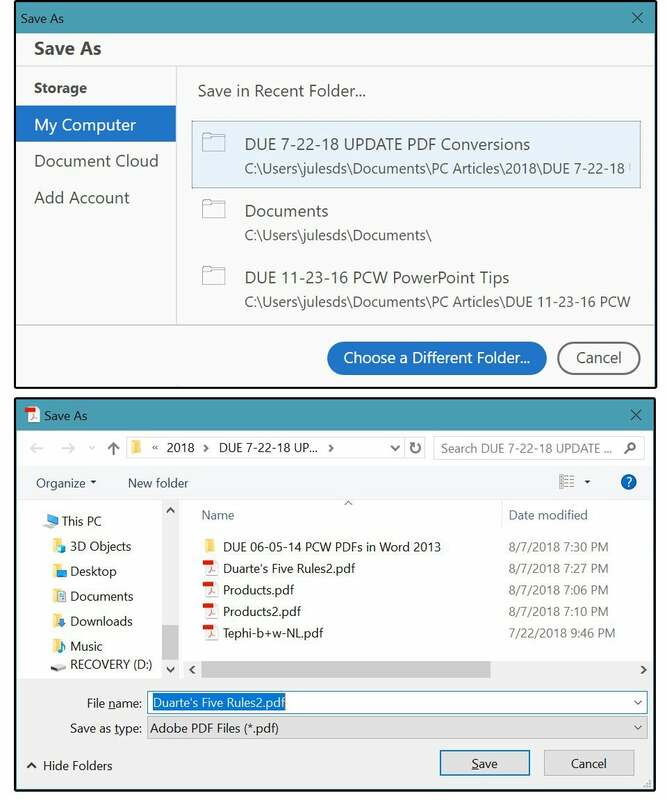 On the Save As screen, confirm the File Name (or change it), select Adobe PDF files (*.pdf) for the Save As Type, then click the Save button. Conversion complete! 2. Select Export To > Microsoft PowerPoint Presentation. 3. On the Save As screen, Acrobat enters the Export File Name for you, followed by the PowerPoint extension pptx. 4. Ensure the Save As Type says: PowerPoint presentation (*.pptx). 5. Click the Save button and the conversion is complete! 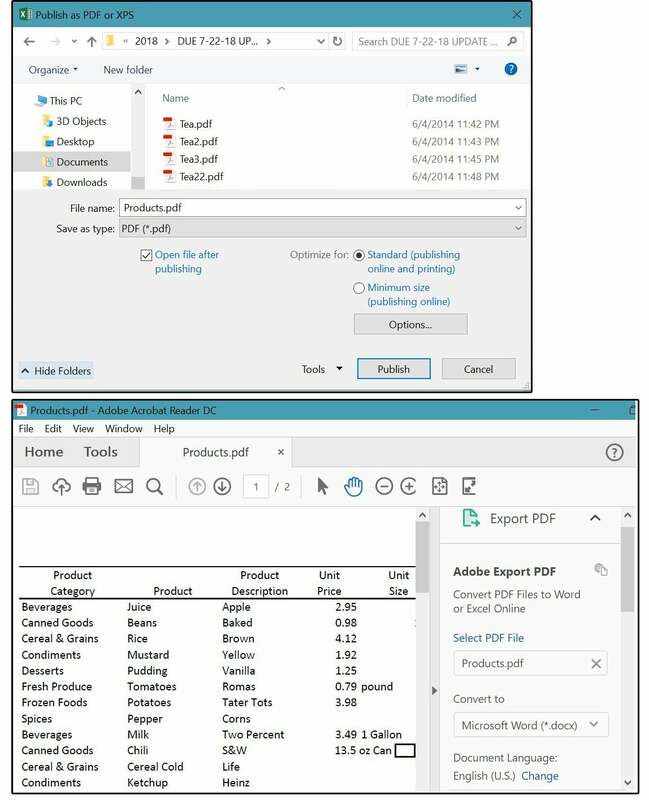 You cannot import PDFs from Adobe Acrobat directly into Excel 2016. This feature is not yet supported in Excel. 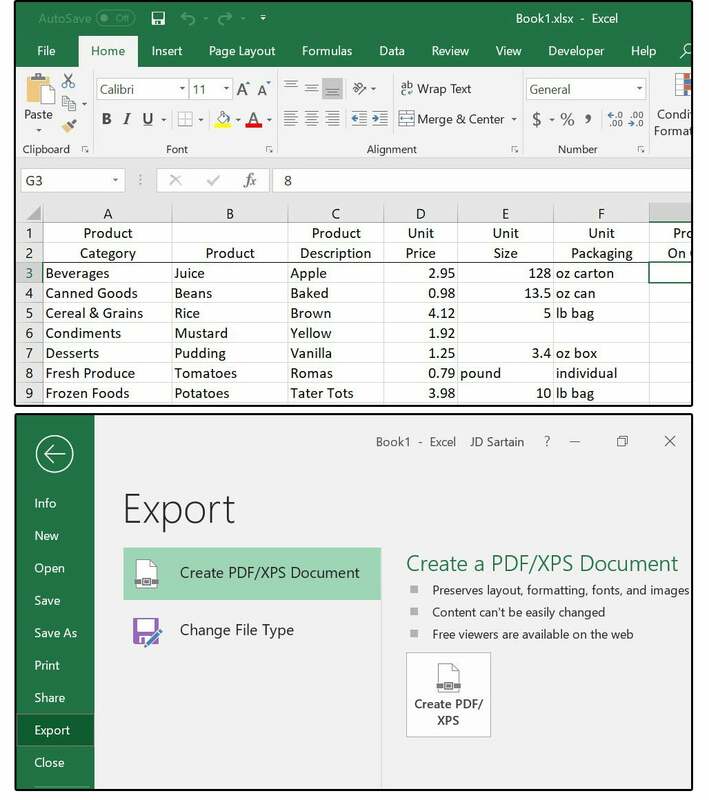 However, you can export PDFs from Excel to Acrobat, and you can export from Acrobat to Excel. 1. To export from Excel to Acrobat, open an Excel spreadsheet. 2. Then choose File > Export, and click the Create PDF/XPS button. 3. 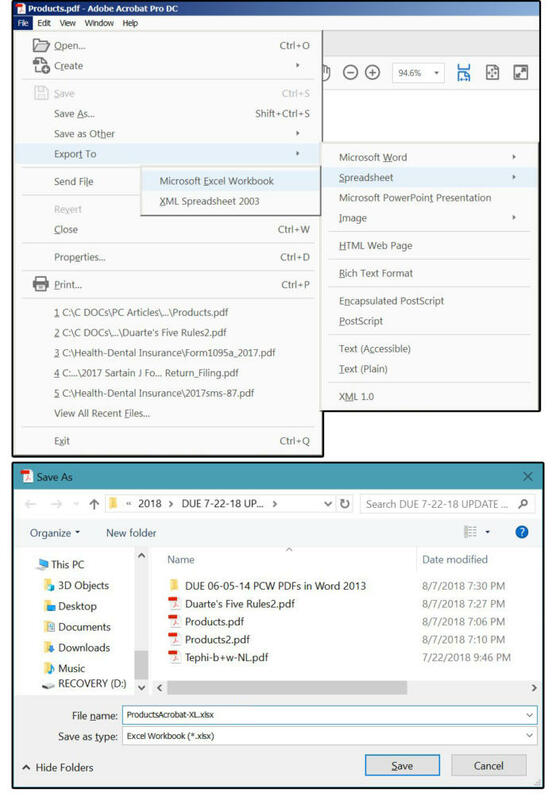 The Publish As PDF screen appears and displays the Excel filename, followed by the Acrobat extension PDF in the File Name field box, followed by the PDF extension in the Save As Type field box (Products.pdf). 4. Click the Publish button and the system jumps to Adobe Acrobat. showing your Excel spreadsheet as an Acrobat PDF file. 7. To export the PDF from Acrobat to Excel, open the PDF file. 8. Select Export To > Spreadsheet > Microsoft Excel Workbook. 9. On the Save As screen, Acrobat enters the Export File Name for you followed by the Excel extension xlsx. 10. Ensure the Save As Type says: Excel Workbook (*.xlsx). 11. Click the Save button and the conversion is complete! This article originally published June 19, 2014.